**Includes a FREE Two-bag set of Triumph aluminum panniers! W'ell give you an additional 10% off any accessories you buy at time of purchase (in stock or ordered) to help outfit the bike! 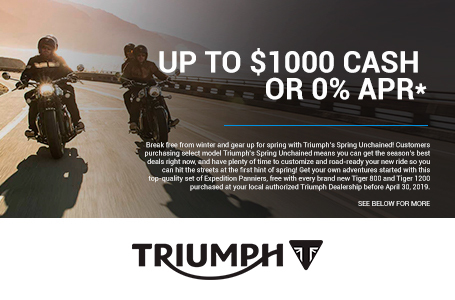 Price quoted includes Triumph's current rebate program with a $1000 rebate to lower price for customer. 1.99% APR also available to qualified buyers, but NOT in conjunction with the rebate. Ask salesperson or see website for more details. Does not include documentation, freight, or taxes and state issued fees. Lighter by 11kg: The XRT is an amazing 11kg lighter than its predecessor, transforming its handling and manoeuvrability. 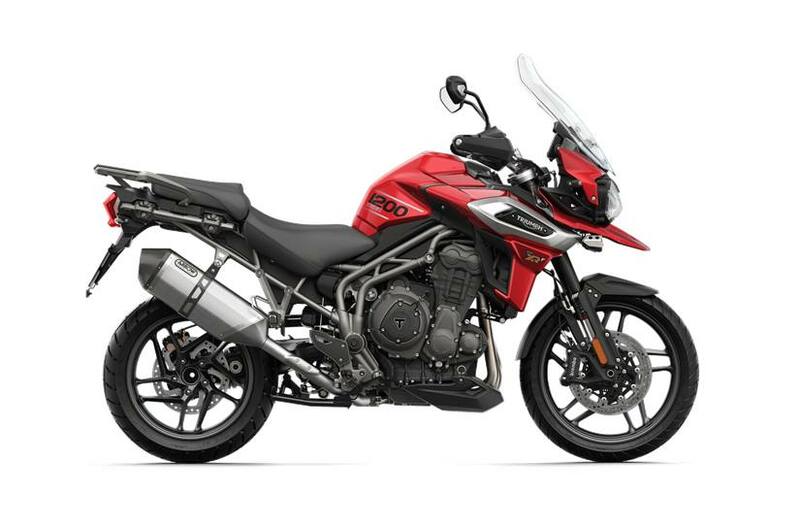 This has been achieved through over 100 enhancements across the whole motorcycle including a lighter flywheel, crankshaft, exhaust silencer, and battery. More powerful and responsive engine: The new generation, Tiger 1200 XRT engine delivers more peak power 141PS (at 9,350rpm) and maximum torque of 122Nm (at 7,600rpm), for a more immediate power delivery and feel, and even better all day, smooth reliable riding. Instrument Display and Functions: TFT multi­functional instrument pack with digital speedometer, trip computer, digital tachometer, gear position indicator, fuel gauge, service indicator, ambient temperature, clock and 5 rider modes (Rain/Road/Off­road/Sport/Rider).